Yesterday in a sunny corner of London, a select group of UK journalists, myself included, were treated to an enrapturing few hours in the company of biomimicry guru Janine Benyus. The group was brought together by sustainable business pioneers InterfaceFLOR, whose long standing working relationship with Benyus enabled them to arrange this exclusive press lunch at raw food restaurant Saf. It was appropriate that Janine spoke to us in the centre of the bustling metropolis as her latest work in the field of biomimicry is focused on using the discipline to inform the design and function of cities. Janine Benyus describes her job as being the "biologist at the design table", a career that she says didn't really exist 10-12 years ago. 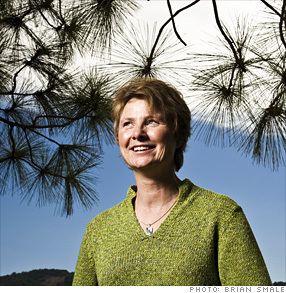 Since the publication of her book, Biomimicry: Innovation Inspired by Nature in 1997, Benyus and her colleagues at the Biomimicry Guild have worked with some of the world's most successful companies including Walmart, Nike and Interface, helping them ask nature for inspiration on how to create more sustainable products and systems. "After my book came out we expected environmentalists and conservationists to get in touch, but in fact it was big business who called. They wanted a biologist to come and talk about how life works. People woke up to the fact that there is a sustainable world in nature that we hadn't been using as a model"
When I asked Janine yesterday what she was currently most excited about, after all these years of working in biomimicry, her unequivocal answer was cities. The Biomimicry Guild has teamed up with HOK, one of the largest architectural developers in the world, to work on city masterplans inspired by nature. "A company like HOK has a massive impact on huge areas of land, due to the scale and breadth of their work. So the question we asked was how can you have a city perform like an ecosystem?" Benyus and her team have been developing the concept of designing cities to an 'ecological performance standard', looking at the original topography of the locale and working out the metrics of how the natural environment should perform. "How many millimetres of soil, how many tons of carbon, how much water stored, how much air purified? It is not enough to have green roofs and walls, we need to ask how a building will store carbon. We need cities to perform like ecosystems, not just look like them."